Aside from some floating dust, our Moon has absolutely no atmosphere to speak of. New research suggests this wasn’t always the case, and that long ago, an atmosphere briefly popped into existence as a result of intense volcanic activity. 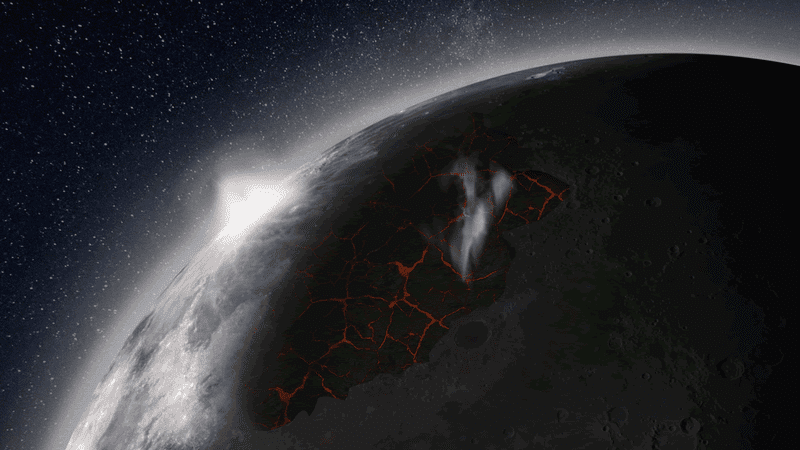 Around three to four billion years ago, powerful volcanic eruptions shot gases above the Moon’s surface faster than they could escape, according to a new study published in Earth and Planetary Science Letters. This created a transient atmosphere that lasted for about 70 million years. Our Moon still exhibits signs of this cataclysmic era in the form of dark volcanic basalt surface features—fine-grained volcanic rock—known as maria. These seas of basalt erupted when the Moon was very young and its interior was still churning with hot magma. During this stage, the roiling lava would frequently burst through the lunar surface and bleed across the landscape for hundreds of miles. All this lava was enriched with various compounds, including the base ingredients for water and sulfur, carbon monoxide, among other chemicals. We know this because the perimeters of these lava seas were explored by astronauts of the Apollo 15 and 17 missions. By analyzing the samples these astronauts brought back, researchers Debra Needham of NASA’s Marshall Space Flight Center and David Kring of the Lunar and Planetary Institute were able to establish the age of the eruptions and document evidence of the gases produced by these ancient lava flows. Calculations made by Needham and Kring show that enough gases were produced by these erupting lava flows to form an atmosphere—albeit a temporary one. The peak thickness for this lunar atmosphere, the researchers claim, would have occurred about 3.5 million years ago, and it managed to persist around the Moon for about 70 million years before it all trickled out into space. The new study highlights a pair of major gas-producing regions, the Serenitatis and Imbrium basins, which were filled with lava about 3.8 and 3.5 billion years ago, respectively. Interestingly, these findings could influence the location of future lunar missions. As the researchers explain, not all of the water produced by these eruptions escaped into space. Which is good news! Future lunar colonists are going to be very thirsty.